Be prepared to fasten your seat belts when you’re headed to the most dangerous airports in the world, because nail-biting endings are a given. Due to a challenging mix of dramatic topography, unpredictable weather conditions and short runways, flying into these airports requires pilots to summon all their skills and experiences to ensure a safe landing. If you’re scared of flying, then we’d recommend skipping these airstrips. Situated at a height of 9325 feet and surrounded by the Himalayas, this small airport has been called the most dangerous n the world. Named after Tenzing Norway and Edmund Hilary, the first two climbers to reach the summit of Mount Everest, it is a popular stop for mountaineers and trekkers since the small town of Lukla is also the gateway to the base camp of Mount Everest. Built on the side of a mountain, its single runway is only 500 m long, 20 m wide and slopes at an angle of 12 degrees. It only allows one-way take offs and landings: planes land from the south-west and take off toward the north-east. At the northern end is a mountain wall and at the southern end, a steep 2000 feet drop into the valley. The airport is serious treacherous: four aircrafts have crashed in the area between 2008 and 2013. The airport of the tiny British overseas territory of Gibraltar has an unusual feature: its main runway is bisected by a busy highway. It runs perpendicular to Winston Churchill Avenue, a major highway that connects Gibraltar to Spain. Every time a plan lands or takes off, the traffic is halted with barriers. Luckily, the traffic at the airport is low, with most of the flights coming from Britain. Originally opened as an emergency airfield during the Second World War, it was later extended by reclaiming land from the Bay of Gibraltar. In addition, the short runway abruptly ends at the Mediterranean Sea on both ends, forcing pilots to hit the brakes immediately after landing. Serving the Dutch part of the Caribbean island of Saint Martin, this airport’s short runway is situated right behind the Maho Beach. Planes approach the runway over water and have to make an extremely low-altitude landing over the beach, flying merely a few feet above the heads of sunbathers. Despite the danger of low-flying planes and the accompanying noise, the beach is extremely popular with thrill seekers. Originally built as a military airstrip in 1942, the airport is named after Juliana, the crown-princess of Netherlands, who landed here in 1944. The magnificent Himalayas surrounding Bhutan’s Paro—some of them over 18000 feet high—also make landing at the airport a rather arduous task. 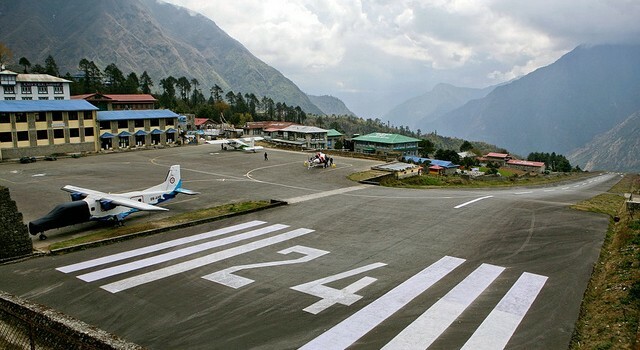 Nestled in a deep valley, this is Bhutan’s only international airport. Only a handful of pilots are licensed to fly into the airport, which operates from sunrise to sunset. Pilots have to negotiate through the towering mountains, face the prospect of air turbulence, and manage a steep ascent on the sole runway, which is just 6500 feet long. However, passengers who can brave the ride also get to admire stunning views of the Paro River meandering across the green valley. The remote isle of Barra in Scotland has the world’s only beach airport used by scheduled commercial flights. Spread across the white sandy beach of Traigh Mhor, it is considered to be one of the most beautiful airports on earth. Here, landings are scenic as well as thrilling. Pilots flying to the airport have to be on the lookout for unpredictable weather conditions as well as sea tides since the three runways are completely submerged during high tide. Numerous signs warn people to stay off the beach when the airport is active.